Location: Val Canzoi - Municipality of Cesiomaggiore (Bl). Access: from the Road of Val Canzoi. Once you get to Soranzén country hamlet from Feltre or from Cesiomaggiore (SP road Pedemontana n.12) following the indications, continue along the road of Val Canzoi that in the valley bottom offers various car parks and various opportunities to visit the calchère (lime kilns). Environmental context - Description of the site: perpendicular to Valle del Piave, Val Canzoi is visible from most of the basin of Feltre, and is one of the privileged tourist accesses of the Park; very busy, also in the valley bottom during the summer, it offers an environment particularly rich in naturalistic features (geological and vegetation interest), as well as historical-human features. The valley is deeply dug and shaped by the course of the Torrent Caorame, and is closed in the north by Sass de Mura (2,550m), its natural background. The complex trail network branching off from the valley gives the opportunity to reach the heart of Alpi Feltrine with its nature sanctuaries. Situated within the administrative borders of the Municipality of Cesiomaggiore, it partly lies within the Park perimeter. Val di Canzoi is characterized by a great concentration of original buildings of proto-industrial origin: they are the characteristic calchère (lime kilns) which, widespread in all the territory of Belluno with more or less elementary structures, were used for the production of lime and were usually built near streams and woods. In Val Canzoi, the quality of the calcareous limestone and the abundance of firewood favored the development of a real lime industry for which the local people used to work for some months during the year. 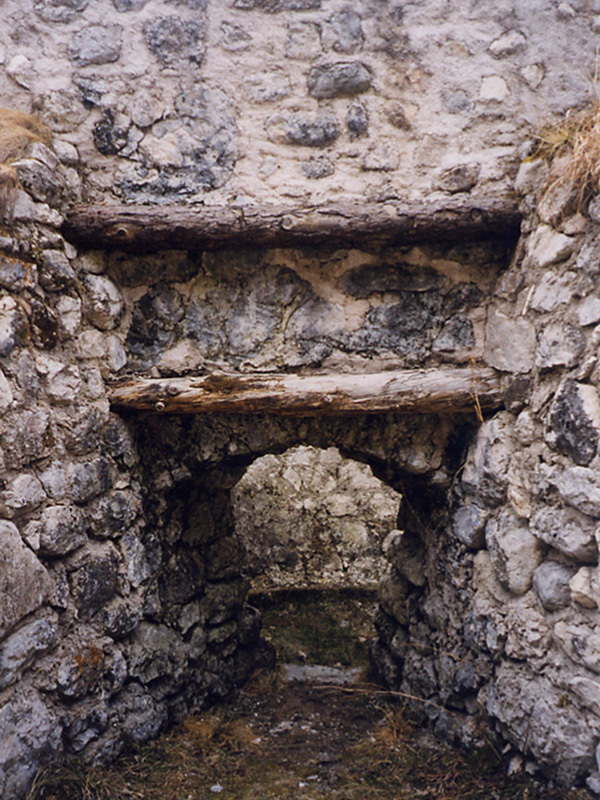 Architectural features: small kilns for the production of lime. Stone-made circular structures leaning against the slope. Great historical-testimonial value. The calchère, dialect name for lime kilns, are big circular furnaces leaning against the mountain slope, rarely out of the ground with chimney, but not in Val Canzoi. The buildings are partly buried and entirely open at the top. They are characterized by a square opening at the bottom, used to introduce the wood and light the fire. The kilns were filled with stones above the fire level, ordered from the biggest to the smallest ones, from the bottom, where they formed a vault closing the firebox, to the top, and then they were covered with gravel. The brickwork structure is characterized by walls with irregular stone and mortar lines (with squared stones resistant to heat) or with brick and mortar. The latter is a more rare and recent example, but it is present also in Val Canzoi. Lime kilns; used until the 1950s. Today abandoned, they are usually characterized by a bad state of conservation. Some structures have been recently recovered for documentary purposes and demonstrations. The production of lime obtained from calcareous stones was very widespread in the territory; usually the presence of the calchère was linked to the availability of wood and calcareous stones and in the area it is also possible to find them also at high altitudes (usually with a small size, functional for the building of malghe and majolere). The characteristic concentration of medium-big size calchère in Val Canzoi (30 recorded structures, 17 still present) witnesses the existence of a real lime industry in the area. Lime, used both in building and for the building and plant disinfection, was produced on commission once a year, in spring. The high-flame combustion had to last at least four days: afterwards, the stones were moved to a pit, dampened, and reduced in very fine powder. The lime obtained in this way (quicklime) was then filtered with a long extinguishing and transformation process (slaked lime). A few calchère have been recently recovered: they include the ones in Fraìna Alta and in loc. La Guarda and, downstream, the calchèra called Pattachin; the latter are well visible and situated along the valley bottom road. Further easily accessible calchère can be found in loc. Al Pretün, in loc. La Guarda (upstream the restored one) and on the right back of Torrent Caorame, under Fraina Bassa, immediately after crossing the bridge. Fornaci da calce (calchère) in Val Canzoi: un esempio di riuso e di tutela, Comunità Montana Feltrina - Centro per la documentazione della cultura popolare, Feltre 1991.